Momma4Life: Nicole Lee Handbags Amber Floral Eyelet Shoulder Bag Review/ Sample Sale Over Half Off!! Nicole Lee Handbags Amber Floral Eyelet Shoulder Bag Review/ Sample Sale Over Half Off!! I love Nicole Lee Handbags and I was recently able to review one. Some things I look for in a bag is something big enough to fit all my stuff in it plus fit some of my son's things too. My son is 19 months and I still have to carry around all the necessities like Diapers, Rash Cream, Wipes, and such. And I really don't feel like carrying around both a diaper bag and a purse. So that is where these awesome bags come into play. This bag is great I can fit all my stuff and then some. I would highly suggest this to anyone that is a Mom also if your looking to have something you can carry everything in. A little about the bag Amber Floral Eyelet Shoulder Bag that retails for $77.99 it comes in 4 beautiful colors Beige, Black, Blue, and Yellow. Sweet with a vengeance Amber in intricately detailed laser-cut eyelet with studs. Exterior features: Top zipper closure, faux python trim, laser cut design with stud accents, Nicole Lee nameplate in front, side chain details, and back zip pocket. Interior features: zip wall pocket with Nicole nameplate at interior back, double open wall pockets at interior front, and NL Polka Dot satin lining. Top handle with 10.5 inch drop. 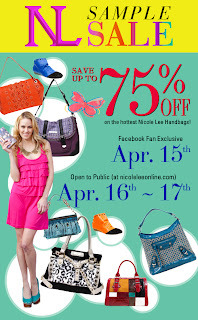 Now for the exciting part for being my exclusive readers I was asked if I could mention this really exciting sale that Nicole Lee is offering. 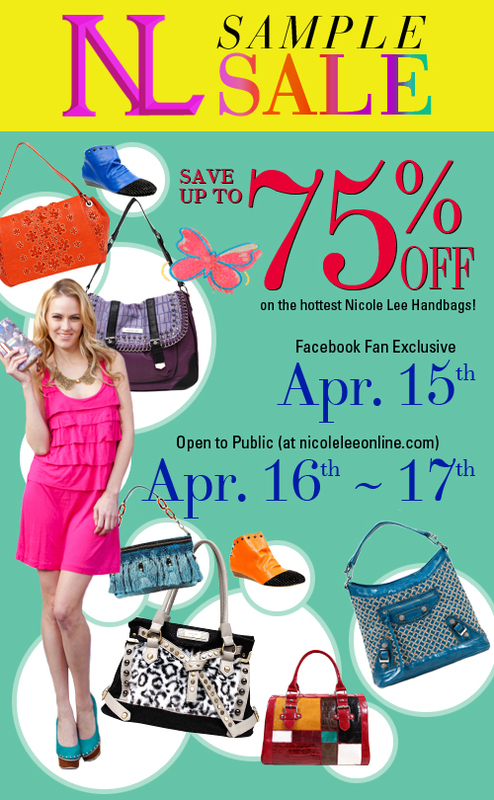 You can save up to 75% off on the hotest Nicole Lee handbags. For Facebook Fans the sale starts the 15th and for all the other's open to the public the sale will start April 16-17 so head over to their Facebook and like their page so you have a extra day to look around. I know I will be heading over their to look around you can't beat this deal so go check it out!! So said to have missed the sale, but so glad to have found out about this brand! Thanks!